Lung cancer is currently the most common cause of cancer-related deaths worldwide. In Canada, it is estimated that there will be an incidence of 26,100 new lung cancer cases, with an average 5-year survival rate of 17%. Within the broad scope of lung cancer, the subpopulation of non-small cell lung cancer (NSCLC) accounts for 85% of these patients. NSCLCs are further divided into clinical subtypes characterized by genetic mutations, such as epidermal growth factor receptor (EGFR) and anaplastic lymphoma kinase (ALK) mutations. Specifically, ALK fusion mutation in chromosome 2 has been shown to be prevalent in 5% of NSCLC patients. 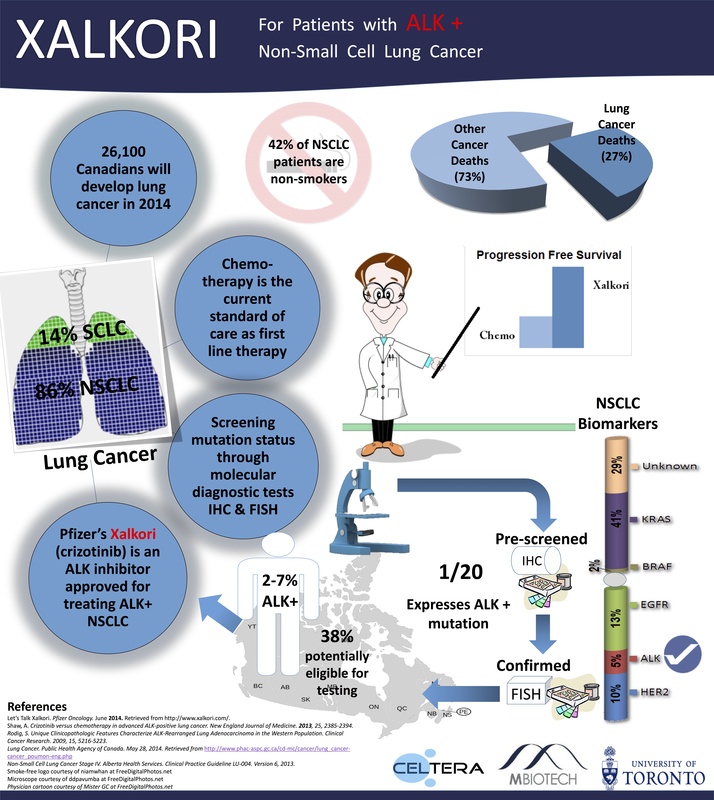 Xalkori (crizotinib), an ALK tyrosine kinase inhibitor, specifically targets the ALK mutation in NSCLC patients, and has been shown to significantly improve the progression free survival of patients leading to an increased quality of life. However, the companion diagnostic assay that has been approved to diagnose the ALK mutation through fluorescence in-situ hybridization (FISH) is not readily accessible to rural Ontario population. Therefore, increasing access to ALK FISH diagnostic assay in rural Ontario will identify higher number of NSCLC patients harboring ALK mutation, and this will in turn increase the adoption and sales of Xalkori. All welcome! Light refreshments will be served at 6pm.